Why do Korean politicians continually insist on splitting the vote? The future is orange, apparently. 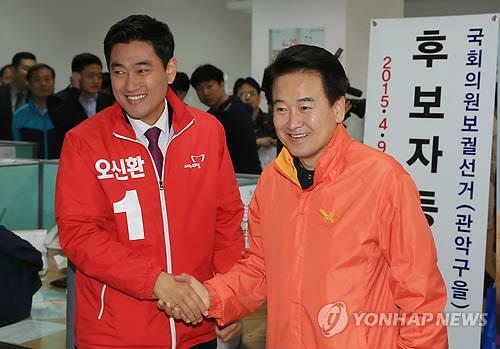 That startling color was Chung Dong-young’s choice as he posed for the press, after registering his candidacy for the Gwanak-B constituency in southern Seoul in April 29’s upcoming by-elections. His garment, a windcheater vaguely reminiscent of the fashion preferred by the late North Korean leader Kim Jong-il, looked a weird choice. But maybe cool liberals don’t wear suits – not even the tieless look en vogue in Seoul, which tends to make Cabinet ministers and such-like stuffed shirts look like they forgot to finish getting dressed. Remember Chung? A former MBC news anchor, he entered politics under Kim Dae-jung and was Roh Moo-hyun’s unification minister in 2004-05. In 2007 he stood for president but was routed by Lee Myung-bak, who took 11.5 million votes to Chung’s 6.2 million. A further 3.6 million went to Lee Hoi-chang, who had lost the two previous elections for the conservatives and now ran as an independent since he didn’t think Lee MB right-wing enough (yes, honestly). Since then we’ve not heard much of Chung. He lost his National Assembly seat in 2012, and wasn’t a contender in the presidential election later that year, when liberal Moon Jae-in ran the right a much closer race. Park Geun-hye won the presidency that year, with 15.8 million votes to Moon’s 14.7 million – and a bit of covert help from the National Intelligence Service (NIS). With Moon Jae-in back as leader of the opposition New Politics Allliance for Democracy (the latest of its many names), you might think Chung’s political return is part of the NPAD’s plan to gear up for the next elections: parliamentary a year from now, then presidential in 2017. Gwanak is south of the river, but Gangnam it ain’t. A poorish area with many migrants from the strongly oppositional southwest, it has consistently voted liberal since democracy was restored in 1987. But now, thanks to Chung sticking his oar in, the left is set to lose this safest of seats. South Korea has a first-past-the-post voting system. So if two progressives split the vote, the right will get in – and vice versa. It’s hardly rocket science, yet time and again South Korean politicians ignore this simple rule. By fighting their rivals, they hand victory to their enemies. At least twice, such self-defeating squabbles have changed history. In 1987 in South Korea’s first fully free election, neither of the two Big Kims – Young-sam (YS) and Dae-jung (DJ), doughty battlers for democracy both – would give way to the other. So they both ran. YS got 28 percent, just ahead of DJ on 27 percent. But the winner was Roh Tae-woo, ex-general and coupmaker, with 37 percent. A united opposition would have gained power five years sooner than it did. YS later joined the right to win in 1992. DJ finally got his victory in 1997, on his fourth attempt; but only by allying with one conservative, Kim Jong-pil, and thanks to another’s vanity. Rhee In-je is Korea’s Vicar of Bray: He’s quit more parties than most of us eat hot dinners. Pipped by Lee Hoi-chang for the conservative nomination, Rhee ran anyway and came third with 4.9 million votes. DJ’s margin of victory over Lee was under 400,000. Had Rhee stayed loyal, Kim Dae-jung would never have been president, there’d have been no Sunshine policy, and recovery from the financial crisis – DJ’s unshakable achievement – would have been far less certain with the party that landed Korea in it still in charge. Weighty counterfactuals indeed. The Gwanak-B by-election won’t be world-changing in that sense, but the math and the sheer perversity are the same. Opinion polls vary on the precise numbers, but are unanimous on the outcome. A survey on April 6 gave Chung 23.5 percent support, the NPAD’s Jun Tae-ho 17.8 percent – and a whopping 43.8 percent to the little-known Oh Shin-hwan of Park’s ruling Saenuri Party, who never expected to win and can hardly believe his luck. Even now, with a new bribery scandal roiling Saenuri that may help the NPAD clinch some of the other three by-elections, a poll on April 15 had Oh still ahead on 37.3 percent, Jung om 29 percent and Chung trailing with 23.5 percent. Naturally the NPAD is furious with Chung. Former leader Moon Hee-sang likened him to the captain of the tragic ferry Sewol. Others decried his run as a cynical maneuver to bolster his position for an eventual return, to fight Moon Jae-in for the presidential nomination in 2017. So he’ll be lucky to pull the same trick twice. Far likelier, Chung’s selfish splitting of the vote will ensure that the liberals lose. That’s a nice present for Park, already beleaguered and now facing fresh turmoil over corruption allegations against several key aides. And it’s a loss the NPAD can ill afford as it struggles to look electable for the big test in 2016 and 2017. Nor is Chung the sole saboteur. In Gwangju, capital of the NPAD’s southwestern heartland, its candidate is trailing another defector turned independent, ex-justice minister Chun Jung-bae. Here the issue is regionalism. Gwangju and Jeolla are DJ territory, hence hostile to Moon Jae-in who like his late mentor Roh hails from the southeast. You’d think that progressives of all people would be above stupid regionalist prejudice, but this remains a nasty running sore. Announcing Chung’s registration, Yonhap newsagency called him a political “heavyweight.” Really? He has an anchor’s smooth looks, but even in his heyday he never packed much of a punch. Come April 29, Gwanak-B’s voters may well reassign him to bantam or flyweight. If they do, it’s his own fault. Unity is strength. Why didn’t he stay and fight within the NPAD? How can sabotaging your own team, so the other side wins, ever be any kind of a good idea? Aidan Foster-Carter is Honorary Senior Research Fellow in Sociology and Modern Korea at Leeds University and also a freelance writer, broadcaster and consultant on contemporary Korean issues. The South Korean Presidency Isn’t Cursed. It Just Needs to Be Reformed. Unless changes are made, Lee Myung-bak won't the the last South Korean president to go to jail for corruption.